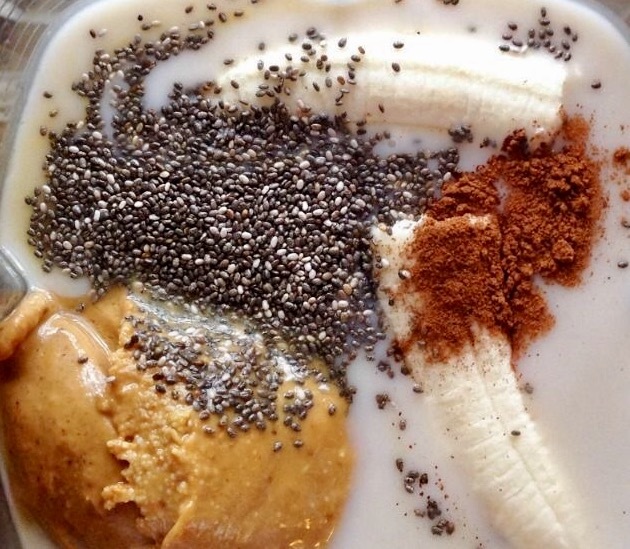 Hidden in this smoothie is one of my favourite super foods, the Chia seed! These tiny seeds are one of the most nutritious foods on the planet. Loaded with fiber, protein and omega -3 fatty acids and various micronutrients. I eat them at breakfast time, either in a smoothie or with yoghurt or fruit, they are so simple to prepare. This recipe is for everyone, and is also great if your pregnant and suffering from morning sickness as protein can alleviate it. In this recipe I use coconut milk but you can use any regular cow’s milk, water or you favoured choice of dairy free milk alternative. Soak chia seeds overnight for easiness or do it when you get up and your getting ready, they will be good to go by the time you want to prepare it. Again soak the chia seeds in whatever you fancy. I use coconut milk, cows milk or almond and if I’ve run out I use filtered tap water. Simples.